It’s a balmy evening at Casalinho as I write. The animals are all shut up for the night and the bats, which I never tire of watching, are beginning to appear. Our dinner tonight will be based around tomatoes and red peppers which I harvested from the garden just an hour ago. It’s hard to believe it’s mid-October. Evenings like this are a reminder of how very fortunate we are. We spent a few weeks in England recently, a wonderful break from farm life and an opportunity to rediscover such wonders as hot running water and supermarkets you can get lost in. Whilst there I had a long conversation with a man who has just set up a food bank in the area, operated by the Trussell Trust. Those in crisis can be referred to the service, where they will be given three days worth of nutritionally balanced emergency food. Incredibly, this is in one of the wealthiest parts of the UK, where a quick scoot around the net tells me that the average house price is £346,000. Another reminder, if we needed one, that we are very fortunate. Even when we’re desperately short of cash, which is pretty much all the time, at least we have the land, the good health and enough knowledge to build our own food security. Everywhere we went in England we saw trees loaded with unharvested apples. I had to be constantly reminded that I had failed to pack jam jars or I’d have been stopping the car on every street corner for a spot of scrumping. So we’ve got a situation where you’ve got people so desperate for food that they need a food bank, yet there is perfectly good fruit lying rotting on the ground. Perhaps it doesn’t look as perfect as the stuff in Tescos, but you can always chop it up. Now I’m not suggesting that a carrier bag full of windfall apples would solve the problems which make a food bank necessary, but really, there’s got to be something pretty illogical about the whole state of affairs. Enough of my ramblings. Volunteers need feeding and dinner is smelling good. 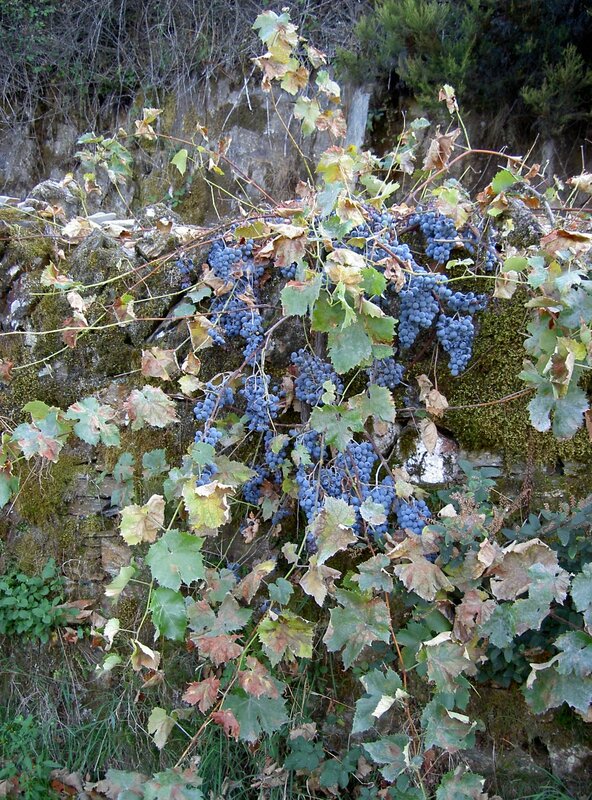 Our biggest project over the past weeks has been harvesting grapes for making wine, jeropiga and aguardente. I’ll tell you more about it next time. There is a growing awareness about food but in the main, all I see when I return to the UK is people too stressed and too busy to think about much more than how long it takes to cook/microwave or where is the local takeaway. Society is slowly waking up to the fact that things need to change but we have a long way to go. It is only when you can take a step outside of it all that you see how ludicrous it all is. We, like you, are thankful we can produce much of our own food. The same area has a waiting list of 250 people all queuing for allotments. So at least 250 people would like to produce some food. What a shame there are no allotments in that area, since the local council paved them for a car park in the mid 1980s. How right you are. It makes me think of a huge pear tree standing 3 streets away from my flat here in Berlin, which is just overfull of fruits every summer with nobody picking them up. People probably prefer to buy bio pears coming by plane from Argentina in the next supermarket at the corner… Okay, this tree is certainly exposed to the pollution of the city, but I also saw this ‘untouched fruits’ problem in the middle of the countryside around Berlin and I remember looking right and left before picking them up, expecting that someone came and told me it was private property or something. But nothing like that happened. Anyway, I was just about to go to the park collect some wood sticks for my stove 😉 Hope everything is alright over there. How I am longing for my time with you guys! Please say hello for me to Mike, Arian, Marion and Kate! Haven’t visited Casalinho (yet) …but missing portugal all the same!